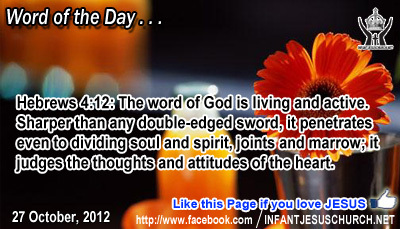 Hebrews 4:12: The word of God is living and active. Sharper than any double-edged sword, it penetrates even to dividing soul and spirit, joints and marrow; it judges the thoughts and attitudes of the heart. Heavenly Father, your will is our heart's desire. But we realize that always we need to be fed more consistently by your Word revealed in Scripture. Give us strength and steadiness in our walk with you through your Word. Through your Spirit, and inspire us to change what needs to be changed and to be blessed and encouraged in the areas that we need it most. We turn to you and trust in your Word to point us in the way of life. We pray in the name Infant Jesus. Amen. The real danger and disaster which Jesus points out is that an unforeseen disaster or a sudden death does not give us time to repent of our sins and to get ready ourselves to meet the Judge of heaven and earth. God, in his mercy, gives us time to get right with him, but that time is now. We must not imagine that there is no hurry. A sudden and unanticipated death leaves one no time to get ready to resolve one's accounts when he or she must stand before the Lord on the Day of Judgment. Jesus warns us that we must be ready at all times. Tolerating sinful habits and excuse unashamed sin will result in bad fruit and ultimate destruction. The Lord in his mercy gives us both grace and time to turn away from sin, but that time is right now. If we delay, even for a day, we may discover that grace has passed us by and our time is up. Do we hunger for the Lord's righteousness and holiness? Loving Infant Jesus, increase our hunger for you that we may grow in virtue and holiness. May we not waste the grace of the present moment to say "yes" to you and to your will and plan for our life.